I can't stop myself! Seriously, where's the help group? American Heiress Delia Chandler leaves Virginia to marry Viscount Ivor Conisborough, completely unprepared for her new place within the royal circle. Soon she is holding dinner parties for Winston Churchill and Wallis Simpson and attending glittering balls with Prince Edward. But beneath the dazzling façade, Delia quickly discovers a world steeped in scandal. It seems everyone has a secret, including her husband. When Ivor is sent to Cairo and appointed advisor to King Fuad, Delia must follow with her two daughters. Like their mother, Petra and Davina are fiery beauties who long to escape the elegant and palatial villas of Garden City for the exotic, wild beating heart of Cairo. But their desires will lead them into dangerous territory, shattering their world as they know it, forever. 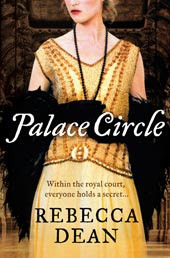 Drenched in glamour, secrets and scandal, Palace Circle is an irresistible combination of real historical events and masterful storytelling. Hey, you won Mistress Shakespeare in my book giveaway! E-mail me at skrishna [at] skrishnasbooks [dot] com with your mailing address and I'll get the book to you. Congratulations! For now, my cut off in English history is Elizabeth I (I do read a few things set during the American, French and Russian revolutions though - huh, wonder what that says about me!!). So, fortunately for me, this one is outside my current boundaries - but the cover is pretty. I can't wait to read this. It looks very interesting. Cover looks great too! I received an Advance copy of this, as soon as I am done with Rose of York: Love and War today I will start this one! I can't wait! Oh, I think this is one I will need to read! I got this off of Amazon's Vine program today. I can't wait. anyone up for a good mystery? Happy Birthday to Queen Mary I of England!